As usual each participant received on arrival a laminated badge with all the necessary information: nationality, director, teacher, student, guest, organiser, etc. But what was novel was the information printed on the back of the badge, where and when the important events for each day were taking place. And a telephone number in case of problems. What a good idea! During the General Assembly president Alfonso Benvenuto made the meeting laugh when discussing the AEHT’s website, especially when he said, ‘All the reports are on the website. You should all consult it every day!’ Adolf Steindl intervened to advise consulting the site once a week, meaning that that often would be already quite good! Each year the presentation of the national delegations is always an important part of the Conference; and (almost) every year there is a little ‘hiccup’ which slips into the ceremony arrangements. This time it was caused by the appearance of the American flag which drew comments from several people, who thought that since we are a European association, this flag should not be displayed among the others. And then there were the Aland Islands, officially part of Finland, which were represented by a participant who, with great courage, had come to wave little flags symbolising this small island off the coast of Finland, which is seeking its independence. The Bled tourist brochures are splendid: blue sky, snow-capped mountains, light blue lake etc. So it was bad luck for the participants in the 17th Annual Conference – someone was having fun playing with the thermometer. The result was a thick covering of cloud over the whole region with mist, intermittent rain and low temperatures. The only little bright period happened as we were returning from the Postojna caves, when a few kilometres from the capital Ljubljana the sun put in an appearance. The AEHT is a great European association and because of this some organisers make a point of including the playing of the European anthem, taken from Beethoven’s Ninth Symphony. We missed this in Slovenia, which became a member of the European Union as recently as the Spring of this year. What a shame! Slightly forgotten Students and Teachers? ‘I say, the Huraults aren’t here this year …’ – say those who have been attending the Conference for years. The Huraults were an almost legendary couple at the Conferences (see Interviews at the Linz conference) and took pleasure in attending, hardly missing any seminars, lectures or the General Assembly. Françoise and Raoul Hurault were quite simply part and parcel of the Conference. Let us hope that nothing serious has happened to prevent them from coming to Bled. Two students from the Bled school took charge of the animation of the major events of the Conference. Katja Pretnar and Gregor Silc are without a doubt among the future leaders of their profession. 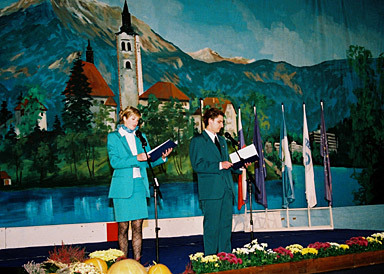 They are totally natural in the way they smile and welcome their guests, and were two superb ambassadors of Bled and Slovenia, bringing their contagious enthusiasm whenever they performed. Well done! Katja Prenar and Grégor Silc : leaders in the making!